According to history, Basotho originate from two major clans: Bafokeng and Barolong; to be precise, Bahurutše who are descendants of the Barolong. 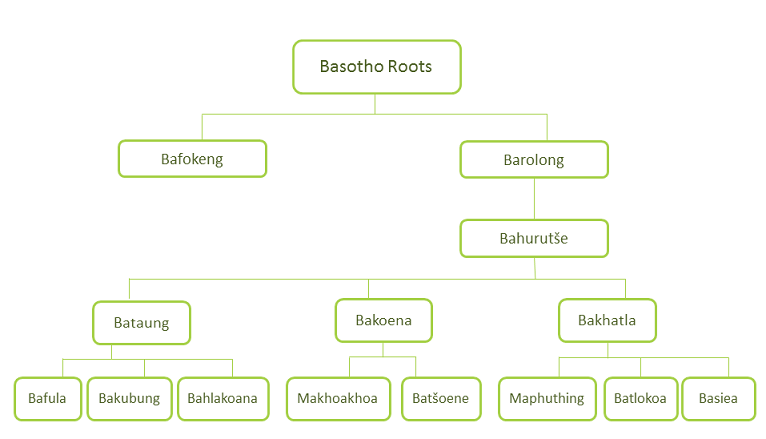 Below is a high-level hierarchy capturing some of the Basotho clans (elaborated from this piece of history). The main goal of the pages under Sub Wikis section is to provide (over time) a compilation of praise poems (odes) of the Basotho clans, “lithoko tsa liboko tsa Basotho”. The basis of this compilation is derived from the work done by Prof. F.Z.A Matšela and Prof. R.I.M Moletsane in a book titled: ‘Mantilatilane. I am deeply grateful for this wonderful fulfilling knowledge. Ke mofokeng Oa ma-Maotoana Finyela and ntse ke sa tsebe Seboko sa rona. ke kopa thuso. hana ke seboko se feng seo batho ba sona ba anang ka sekho? Ntsoarele ka ho se khutlele ho uena ka pele. Karabo ke: Baphuthi! Bona ba re ba ne ba theohe ka tepo ea sekho ho tsoa Leholimong. Can you please clarify the relation of Bahlakoana with Bataung and Bakwena. There seems to be some confusion / conflicting messages on your pages. On the Bahlakoana page you say they are Bakwena, but on the origin of Basotho diagram you indicate they are from Bataung. I am a Mohlakoana, however did not grow up with BaSotho so I would like to know more about this heritage. My apologies the graphic is incorrect. The text however is correct. Bahlakoana stem from Bakuena. There is much contenstation around how they came to be.My sense is both dominate narratives around Bahloakoa are valid. There are Bahlakoana whose identity was forged through the polygamous family dynamics, where children from a younger family felt alienated—this speaks to the tlhakoana narrative. Bahlakoana rooted in the hlaha-koana narrative still felt alienated from the major families; their alienation however stemmed largely from nomadic existence. All in all, my advise is to seek the position of the elders in your family to make sense of your roots. I took a conscious decision, because of time and other things, to not do indepth explorations of Bahlakoana and many other clans. So I really cannot help beyond the little I have provided. 2018 – doing assignment with my cousin for her high school project.